It’s that time of year. Produce stands are overflowing with a bounty of veggies and fruits that can help you live a long and vibrant life. Kale: A popular leafy green, kale contains 12 times the recommended daily allowance of vitamin K, which may help fend off heart disease and osteoporosis. Kale is also high in fiber, known to lower blood pressure and cholesterol levels. Serving suggestion: Slice kale leaves across the grain into thin strips. Add to a hot pan that’s been coated with a tablespoon of olive oil. Add garlic, salt and pepper to taste. Sauté for 5-7 minutes, stirring constantly. Eggplant: Nasunin is a nutrient that fights the spread of cancer cells. Nasunin is found in the purple skin of the eggplant. There’s some research that suggests nasunin slows the development of Alzheimer’s Disease. Serving suggestion: Cut an eggplant into 1 inch cubes and add it to a pot of simmering pasta sauce. Cook until soft and ladle over pasta. Brussels Sprouts: The sulfur found in Brussels sprouts may help our bodies suppress the growth of tumors. Also, a 2012 study found that sulfur could aide those with rheumatoid arthritis by reducing inflammation and activating cartilage-protecting proteins. Serving suggestion: Slice Brussels sprouts in half and sauté in olive oil with a sprinkling of sea salt. Or toss whole Brussels sprouts with olive oil, sprinkle with salt, and roast until golden. Tomatoes: Lycopene is an antioxidant that fights against free radicals (molecules that can damage cells and suppress the immune system). 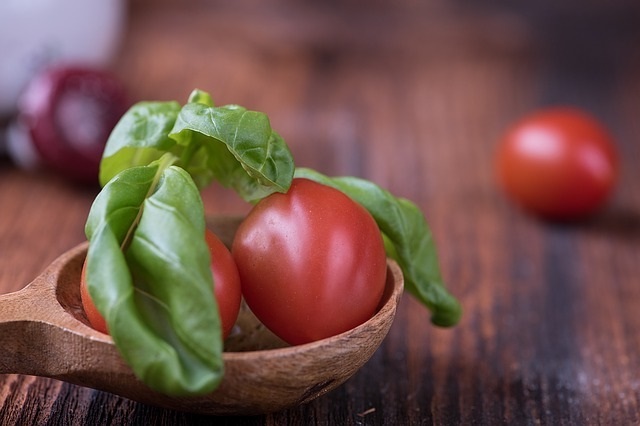 Tomatoes are lycopene-rich and studies have shown they can protect against some cancers. If you can find Classica tomatoes, choose them over other varieties. Classicas have the highest levels of lycopene. Serving suggestion: Tomato sandwiches on toast is a favorite summertime lunch, or add some tomato wedges to a fresh salad. Red Peppers: Vitamin C triggers the production of white blood cells that fight off germs and bacteria. Red peppers contain 60 percent more vitamin C than green bell peppers. A study published in The American Journal of Clinical Nutrition states that people with diets that are high in vitamin C have fewer wrinkles because, possibly, the nutrient promotes the production of collagen. Serving suggestion: Try adding red peppers to a stir-fry, or roast them to bring out their sweetness. Blackberries: The high levels of rutin, an antioxidant, found in blackberries may block an enzyme linked to the forming of blood clots, lowering the risk of strokes and heart attacks (according to a 2012 study at Harvard Medical School). Serving suggestion: Make a blackberry cobbler, or stir a handful into pancake batter. Basil: Eugenol is an antioxidant that has been recently shown to spark anti-carcinogenic activity; lab studies show eugenol can cause cervical cancer cells to self-destruct. Serving suggestion: Tear basil leaves into a salad, or snip some into a pot of pasta sauce. So what are you waiting for? Go out to your local farm stand and pick up some of these powerhouse foods. They’re not only nutritious, they’re also delicious. USA Today Bestselling Author Donna Fasano has written over 30 romance and women’s fiction novels. Her latest publication is FALLING FOR A SINGLE MOM Duet Bundle, available for Kindle, Nook, Kobo, iBooks, and Google Play. Labels: Anti-Aging Naturally, Eat colorful vegetables, Fresh Produce, How can I boost my immune system?, Why should I eat vegetables? I have all of these foods often, except for the basil. I had no idea it sparked anti-carcinogenic activity. That's fantastic. I plan to add it to my diet then.